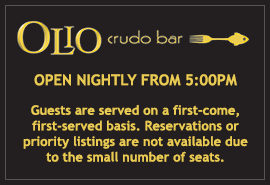 Prix fixe menu required for parties of 6 or more during dinner at Olio e Limone on Saturday, June 17, 2017. $50.00 per person, food menu. Beverages, alcohol, tax and gratuity not included.